You'll notice I'm home. 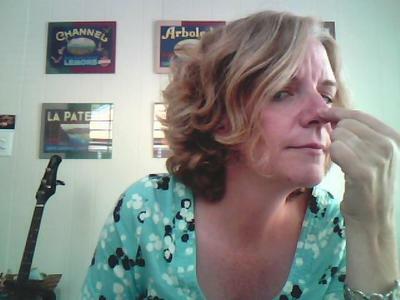 And troubling myself about my nose. I HATE the ball on the end of my nose. Thanks, dad. Thanks for the ball. Don't give me any of your mathematical abilities, or your sense of direction. I'd even take your ability to play darts. But no. I get the ball. I am home because I had a dentist appointment at 2:00. You do not even understand how I have been dreading this. I am HORrified of the dentist. Last month, I was at home one night, proofreading, and I thought, "That tooth seems a little sensitive." So I put my finger up there, and OW. When I discover a tooth hurts, the first thing that happens is my entire body goes numb from terror. Then I consider suicide. Really. I consider whether I should just throw myself in front of a train instead of facing the dreaded dentist. I kept putting it off until the fear and obsession grew to gargantuan proportions, and finally I called a dentist here. Of course, he really couldn't find anything wrong with my tooth. He kept saying horrible things like, "Does this one hurt? You had a root canal there, and it could be the root is growing back." Okay, what? I figured root canal, you are done. You have done everything possible to that tooth and you never have to worry about it again. That's what I thought. Okay, thanks. Thanks for giving me a new worry. You have just given me an ALL NEW thing to wake up and think about, along with terrorism, esophageal cancer, crabs and angina, all of which I have thought I had this week. Well, you can't have terrorism. But I heard something boomy the other night. Anyway, he decided maybe one tooth is sticking up too high, so he drilled it down and we are hoping that's the end of it. Could it be that I have become a tooth hypochondriac? Oh, and he mentioned I had a deep pocket, which come on. The pants don't even HAVE pockets. Anyway, I have to go get a deep cleaning next. I knew I was a slob. So, that is why I am home today. And Sleeping Beauty? I am going to run 12 miles the week before the race. Is that bad? And for the person who lives in Greensboro? If I decide to go back on the running route site, I am so emailing you. And for Mrs. Q, who gave me a blog award like three weeks ago and I have yet to acknowledge it? Thank you. I got it when I was on vacation and I know I am totally rude and ungrateful. And I also have bad teeth. Next Post Alpo, Milk Bone, Metal Crate; I’m the Class of 2008! A little late commenting here, but 12 miles the week before the race? You did a marathon – you know about the taper :o) I think…. anyway, the tapering, you don’t run your longest run just before the marathon. In fact there is like 3-4 weeks of tapering. Sure this is a 1/2 marathon, but I would think 12 miles the week before might tucker your body out. Maybe do 8 again. or 10? You could alway have plastic surgery LOL! Not! As for your fear of dentist, I understand–completely! gee, thanks, June. Thursday I go to the dentist for the first time in like, 12 years. since i was 14!!! and i don’t floss!! and, mostly i only brush once a day. but i promise my teeth aren’t all grody and my breath doesn’t reek. or at least as far as i am aware. the dentist might have a different view on things. but. i have just started flossing, because i am in love with that Reach Flosser because it gets between my teeth that are so close together, probably due to the wisdom teeth that have been trying to come in for the last 8 years. so yeah. kinda feeling icky about Thursday. and i’m not afraid of the dentist, i’m just lazy, that’s why i haven’t gone!! hopefully this last week that i’ve been flossing will be a BIT of help in my favor. argh. I have the fear. The fear of the dentist. I had the same issue except my tooth pain was from a sinus infection (who knew?) I also had “pockets” and had to do the deep cleaning. They do it in two parts, one side of the mouth, then the other. My dentist numbed me all the way up and that, seriously, was the worst part of the whole shebang! After I got all of my cleanings done, I treated myself to whitening trays. Oh, what fun! I’m on day 6 of the 14 day whitening process and i’m in LOVE with it! Too funny. Not your nose, of course. Your nose is fine. Really. Also, not your fear of the dentist. Totally understandable. It’s the other stuff you said that’s funny. Hey, thanks for stopping by. I hope you win so you can clean the nose smudges off your webcam. See? I’m funny, too. Right? Right????? You can pick you friends and you can pick your dentist? but you can’t pick your nose. Well, you CAN pick you nose, but you can’t choose your nose. Unless, of course, as Golden Toof says, you pay for it. Hey, that sounds like the title of the next James Bond movie, Golden Toof. …and lastly, I’d much rather hear that your Dad gave you the ball than the crabs. LOL! Yet another reason why I love you. You make my fear of the dentist look mild. Let’s hope there is nothing wrong with that tooth! I have discovered a sensitive tooth, and I know it’s a cavity. I’m pretty good at spotting them now that I’ve had THIRTY. No lie. THIRTY. The best way to avoid crabs is to stay outta the Wal Mart bathrooms.I have a horrible nose,so I knows what your saying.Yes, that was my feeble attempt at humor. June you crack me up at times. :o) I hope your denitist appointment goes well. 12 miles? WHY? You’re gonna get yourself all tired ‘n s*#t. Did Jeff Galloway say to do that? Crap. Umm. Fabulous. Not fabulus. Sheesh. How about simply embracing the bulbous nose? Surely there are uses for a ball at the end of ones nose. For example, you could entertain your dog by balancing a ball there. OR, you could dress as Rudolph for Christmas and color it red. Hey! Why not decorate it? If you can’t beat it….join it? After having read all your posts and having seen all the pictures you’ve posted….I can honestly tell you that I for one never noticed the “ball” at the end of your nose. You do have fabulus hair though. Hey! Buy a new nose instead of that ring you’ve got your eye on. If you want to.